The gallery will open for the next exhibition on Wednesday 27 February (10am–6pm, Tuesday – Sunday and Bank Holidays). 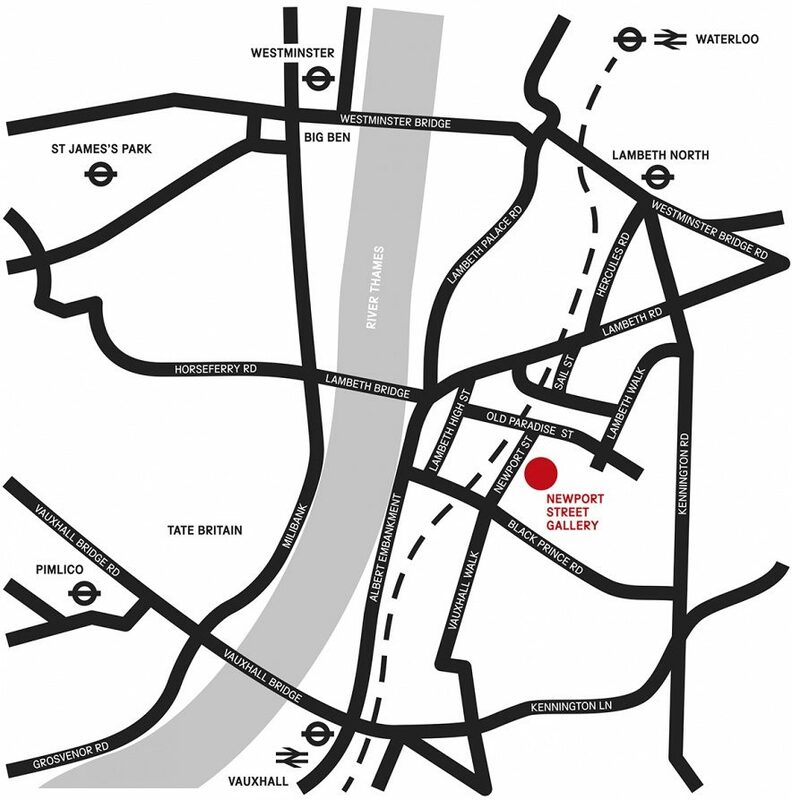 Newport Street Gallery is on route 3 of the London Cycle Network. There are 16 bike rack spaces available for visitors located outside the main gallery entrance on Newport Street. Newport Street Gallery does not have any visitor parking so we would encourage you to take public transport where possible. The parking bays on Newport Street are for permit holders only from 8.30am to 6.30pm, Monday to Friday. The nearest pay and display parking spaces are on Juxon Street (5 minute walk) and have a maximum stay restriction of four hours. The nearest coach parking bays are on Lambeth Road and have a maximum stay restriction of four hours. Holders of Lambeth Council blue disabled badges may park in residents’ only bays providing the blue badge is displayed. Pay and display bays may also be used for up to four hours, providing both the blue badge and clock are displayed. The gallery is fully accessible from the Newport Street entrance and there is a lift to access all floors. There are two wheelchairs available that can be booked in advance. Guide dogs are permitted. There is a hearing loop at the gallery reception. We are not able to offer gallery tours or arrange group visits but the gallery is open and free to the public. Please contact us at info@newportstreetgallery.com if you are planning to visit in a group of more than 10 people so we know to expect you. The maximum group size is 20 people. If you are planning to visit as part of a larger group, please divide into smaller groups of 20 for your visit. Please do not consume food or drink in the galleries. No animals are permitted anywhere within the building with the exception of guide dogs. Smoking is not permitted anywhere within the building. Please do not touch the artworks on display. Even clean hands can damage surfaces. Professional photography and filming is not permitted without prior written agreement.